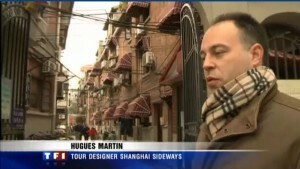 The blog Shanghailander.net was started a few years ago to tell stories about Old Shanghai to my friends in the city. It has now grown much further than this primary objective. There are about 800 people a month reading the blog online along with many others subscribing to the RSS feed. Foreigners who actually lived in Old Shanghai in the 1930’s wrote to me and I have even been involved in writing articles about the topic as well as becoming the tour designer for Shanghai Sideways. The last one was a 52 minutes report broadcasted on French cable TV Telemaison. The 10 minutes part I appear in is also focused on Shanghai history, unfortunately it is not available on the internet. I only have it on DVD at home. I have also been working on a series of documentaries about Shanghai history for Shanghai based channel Dragon TV, The film will be in Chinese which was a great challenge. It is still in production at the moment.